Advocating to make ‘sedition’ a non-cognizable, bailable offence and reducing the term of imprisonment while seeking statutory backing for the definition of ‘sedition’ as envisaged in the 1962 judgment, Bombay High Court Lawyer Abhinav Chandrachud has said advocates should be given absolute protection from criminal defamation. He was speaking at a debate held at the ongoing Zee Jaipur Literature Festival on the issue of freedom of speech and expression in India, in context of his book, Republic of Rhetoric- Free Speech and the Constitution of India. 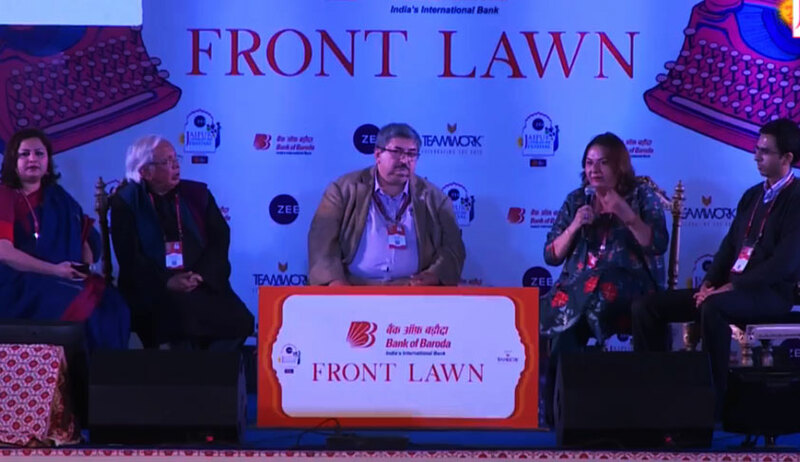 The debate, mediated by writer-journalist Salil Tripathi, saw Additional Solicitor General (ASG) Pinky Anand, advocate Abhinav Chandrachud, writer Ashok Vajpeyi and Central Board of Film Certification (CBFC) member Vani Tikoo Tripathi as panel speakers. “Some limbs of the Constitution are very radical, such as, Article 17, making untouchability punishable, and Article 18, abolishing titles. There is also the right to vote. On the other hand is Article 19(1)(a), conferring the freedom of speech and expression, which is curtailed by the restrictions of sedition, obscenity, hate speech, contempt of court, etc, by Article 19(2)- the provisions of the IPC, which was drafted in colonial India, have been introduced in the Constitution. ‘Sedition’ was a misdemeanour, a bailable offence punishable with 2 years’ imprisonment in England, but in colonial India, it was a non-bailable offence attracting life imprisonment. The situation has not changed post Independence. With the introduction of the CrPC of 1973, it is also cognizable offence,” he continued. “Although ‘sedition’ under Section 124A of the IPC does not require an act of violence as an ingredient of the offence, in the case of Kedar Nath v. State of Bihar (1962), the Supreme Court observed that only seditious acts that incite violence shall be punishable. Even obscenity is being interpreted in accordance with the contemporary standards of the society. A transition is coming,” she continued. Author Vajpeyi addressed three issues - one, how the language of public discourse has become harsh and abusive, foreclosing discussions; two, how the power of language is being undermined by simplistic interpretations, for instance, in the recent case of agitation against the public exhibition of the film Padmaavat even before it was displayed; and third, how the public life is dominated with lies. CBFC member Tikoo spoke of the lack of consensus between the judgments of different high courts and the apex court on the freedom of speech and expression. In relation to the judicial trend of certification of films, she advanced that the “content be judged in the context of the narrative of the film”. “Are we not elevating the right to be offended over and above the freedom of speech,” asked the mediator. “Every allegedly wrongful act should be judged individually on its merits. The Supreme Court ordered that the film should be released so it has been released. The rule of law confers the right on the judiciary to check if something is wrong,” added Anand. Chandrachud replied, “‘Sedition’ has been deleted as an offence in the UK in 2009. But though that may not be desirable in India, as when a FIR is registered, a policeman may not be able to distinguish between the concepts of advocacy and incitement, ‘sedition’ should be made a non-cognizable, bailable offence and the term of imprisonment should be reduced. Also, the definition of ‘sedition’, as envisaged in the 1962 judgment, should get statutory backing. He also suggested that advocates should be extended absolute protection from criminal defamation, and not a qualified privilege where they are made to undergo trial to prove that a comment was made without malice and this was also supported by Pinky Anand. Opposing external restraint to the largest extent possible, Anand stressed on “constraints of reasonableness” and the need for “education with responsibility and innovation”.